Korea, is put on the air. It is already in its third season. the final qualifiers for the next round are selected. everybody on the show(kpop star 3 audition). She was assigned to Antenna Music. 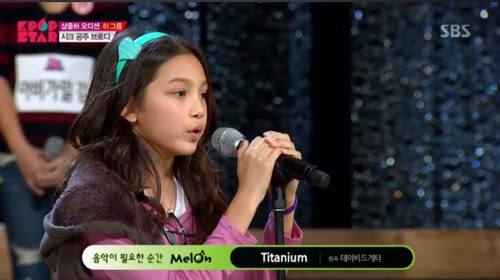 The song which she chose was David Guetta's Titanium. The voice of a 10-year-old girl was so clear. Also, her high-pitched tone was just perfect. All three judges were fully satisfied with Brodie. It seemed that another big star was on her way. and said, "It seems that she practiced so hard to improve her skills. I almost cried when I saw her performing on the stage. will continue to improve her skills. I am very surprised to see such great effort of hers." 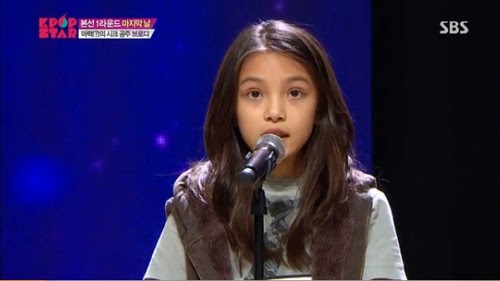 After watching the program, netizens said, "Brodie in K-Pop Star 3 is just amazing. She has shown a great level of development. It seems that the judges can't help loving her." musical talents, instead of such big entertainment companies as YG and JYP. one of the popular portal sites in Korea.